I’m going to do my best to maintain a Paleo-ish lifestyle. I know my body doesn’t respond well to carbs so I really need to make it a point to cut them out as much as possible. I’ve found so many great recipes that are compliant, including this one. Even though I don’t have an issue with dairy, this is a nice recipe for those who do. This was a breeze to make, and reheats very well. Sprinkle some pumpkin seeds on top and you’ve got a great meal or appetizer. Delicious! Add coconut oil and onion to large pot over medium heat. Saute a few minutes, then add squash, stock, cinnamon, salt and nutmeg. Bring to a boil, then cook until squash is fork tender. Transfer to food processor or blender and puree until smooth. Garnish with pumpkin seeds and a dash of cinnamon. 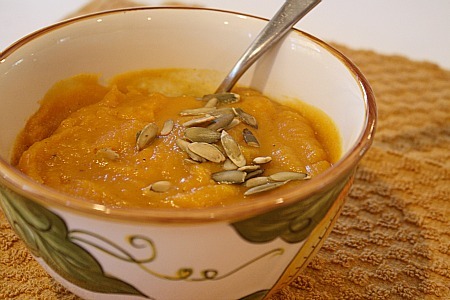 This entry was posted in appetizers, freezer friendly, low carb, main dishes, make ahead, QuickAndEasy, soup, squash. Bookmark the permalink.